Bryanna loved horses from as far back as she can remember. So it was no surprise that when her mom asked if she wanted to attend a high school with horses, she instantly said, “I’m in.” That was years ago and Bryanna is one of our graduates from our alternative high school, Gaitway. She says her experience at Fieldstone Farm has helped her confront her anxiety and become a more positive person. “When I am with horses, I just settle down. Horses don’t judge you, they don’t live in the past, they live in the now,” she says talking about the bonds she made with our horses. “I know when I am with them everything is going to be okay,” she says recalling one day when everything was going wrong. She remembers walking into Rascal’s stall to bring him out for a lesson, and she gave him a hug. Instinctively he knew she was upset. She didn’t have to explain what had gone wrong or how she was feeling. He just gently laid his head on hers and comforted her. It was exactly what she needed. He understood. It made the tears rush out. 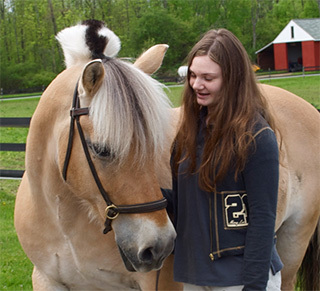 The horses at Fieldstone Farm and Gaitway High School have changed her life and helped her to chart a new course for her future. This entry was posted in Fieldstone, Gaitway. Bookmark the permalink.